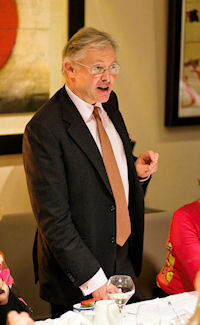 Guy Boursot is an experienced after dinner speaker and is happy to travel far and wide according to clients' requests. There is always a theme that relates to wine but these talks differ from other presentations by being more focussed on humour and anecdotes about the curious past and present goings-on in the world of wine. Alternatively, you could request Guy talks about the wines as they are being served through your meal with one of his entertaining forays into the world of wine as a fitting conclusion. Most options are possible and Guy will do everything in his capability to ensure that your guests enjoy the entertainment. If you wish to exchange ideas, discuss this further or make a reservation, please call Guy on +33 676 10 32 41 or e-mail him on guy@boursot.com.